Part photography, part art, ToonPAINT is a surprisingly delightful app. 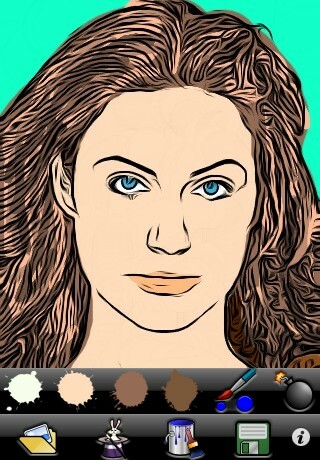 I’m absolutely wretched at drawing, but ToonPAINT makes creating custom portraits as simple as using a coloring book. Instead of sharpening your images, ToonPAINT strips out all color and reduces photos to simple lines, making them look like black and white drawings. That in itself wouldn’t be very impressive, but ToonPAINT goes one step further and gives you some fairly robust coloring tools to really make the pictures shine. The icons are a little mystifying at first, but there are only a few, so it’s not so bad. The folder icon allows you to choose a photo, either by taking a new one or selecting from your photo album. Clear, bright, high-contrast pictures seem to work best for this, as dark photos come out looking like a mass of black lines. Once you’ve got a picture you like, ToonPAINT will turn it into a black and white “toon”. You can do things like adjust the edges for a softer, more natural look, but once you’ve got the lines the way you want them, you can start to go wild with color. Touching the paint bucket brings up the color menu. You start with what looks like a very limited palette of four paint splotches, but you can double tap on a splotch to select any color or shade you want. There are even options to use an eyedropper color select tool on the original photo or a color you’ve already used on the picture. Painting is simple as swiping your finger. The brush icon allows you to adjust brush size, and double tapping or pinch zooming lets you in close for finer detail work. It’s annoying that there isn’t a way to move about the screen while zoomed in, but if you should make a mistake, you can easily undo or redo a stroke by clicking on the bomb icon. I would have also liked the ability to undo more than just the last stroke, but you can also easily color over mistakes, as colors do not blend or overlay. Getting a picture fully colored in takes a fair bit of practice and patience, but the results can be quite stunning. One of the nicer features included is the ability to save either in regular or high definition resolution, if you should wish to show off your creations elsewhere. You can also choose between saving the basic black and white sketch or sketch with paint. I really loved the creative flair ToonPAINT introduced to my photos, and while the controls can be a little awkward and confusing at times, the lovely results make ToonPAINT a well-worthwhile purchase. AppSafari review of ToonPAINT was written by Tracy Yonemoto on June 7th, 2010 and categorized under App Store, Art, Fun, Photos. Page viewed 5930 times, 1 so far today. Need help on using these apps? Please read the Help Page. toon PAINT…..This app was a total rip off. After purchasing it, the app keeps sending messages that you have to make additional purchases in order for it to work.